I developed and produced "Fun Food Lunch Count" in the summer of 2000. I saw a need when our public schools in Waterloo decided to give our students an alternative lunch choice. At the time I was working at Orange Elementary in the Kdg. and 1st grade rooms. The teachers thought that it took enough time to do lunch count every morning and they were a little frazzled to think now they were going to have to give the students a third choice to ponder over. The first bulletin boards I made were black and white pictures I copied out of books. The teacher's loved the ease in which the students could come in and choose their lunch and then go right to their seat and get to work. We also had 2 ESL Kindergarten classroom's in our building and their teacher's and interpreter's especially liked the bulletin board. Before the bulletin board our Bosnian interpreter's would have me describe what certain lunches were, such as corn dog, so they could explain it to their student's. After a little coaxing from the teacher's I worked for, I decided to produce the bulletin board. It was a real challenge. First of all I knew I could not use any of the pictures of entree's that I had used previously. So I purchased a digital camera and started taking pictures of the food entrees that the Waterloo schools had on their monthly menus. Then I logged onto the internet and searched for menus from schools across the U.S. I took pictures of 65 entree's to start off with. I then scanned a picture, I had sketched, to put on the card's, that would also have the name and picture of the entree on it. 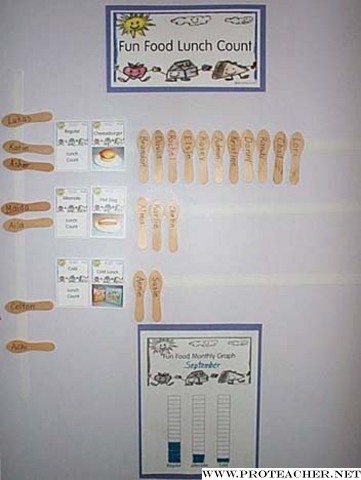 As you can see I am not an artist, but the picture was so cute I called the bulletin board "Fun Food Lunch Count". I purchased flat wooden spoons from an internet co., bags from another co. and had the bulletin board printed in Cedar Falls, IA. I even had my bulletin board copyrighted and registered a trademark.